Traditional french enamel steel sign, size 15x20cm. Custumize your own 15x20cm vintage french enamel plaque. Fill the form in with the name or short text you would like to create. 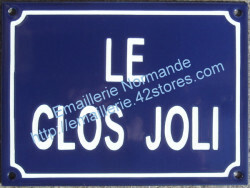 This traditional french enamel street sign style may be either blue, green or black. At first, a model will be sent to you to be accepted.